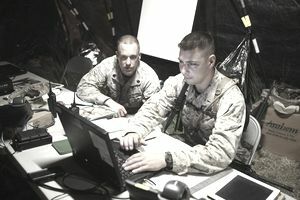 Information Assurance Technicians are called Cyber Security Technicians and are on the "front lines" of securing the communications networks of the Marine Corps. This MOS is an advancement in training and certifications after a tour or more and successful progression in rank. For the information systems operator seeking more knowledge in the cybersecurity field, the next step is the Cyber Security Technician. There are many civilian opportunities holding these types of network communications systems security skills, but there are also many well-paying jobs within the government if you hold many of these cyber warfare skills. The below is a list of requirements and descriptions of how you can obtain these skills within the enlisted ranks of the United States Marine Corps. Rank: Once you reach the rank of Sergeant, you can start to progress toward the cyber warfare side of the information specialist job. You can remain or obtain this MOS at the rank of Master Gunnery Sergeant as long as you have as least two years on your end of enlistment date. Information Assurance Technicians (MOS 0689) are now called Cyber Security Technicians and are responsible for the security of all information systems and its integrity, authentication, and confidentiality. The original name was created after the main requirement of having graduated from the Information Assurance Technician Course in 29 Palms. Cyber Security Technicians advise the commander that the communications and information systems are secure and meet the security and governmental standards set. Additional duties include creating and execution of security policies, plans, and procedures for the network and other communications systems. Data network security measures, network intrusion detection, computer forensics, system security incident control, and keeping all networks within standard of Marine Corps certification is more of the job description of this MOS. The progression of this MOS includes training from Staff Sergeant to Master Gunnery Sergeant with the Information Assurance Managers Course (IAM) and Cyber Security Chiefs Course. (1) Must possess MOS 0651, 0656, or 0659. (2) Must have attained the rank of sergeant or above. (3) Complete the Information Assurance Technician Course, MCCES 29 Palms, CA. (4) Active duty must have two years of active duty remaining upon graduation from training. (6) Must possess a GT score of 110 or higher. (7) Security requirement: Sensitive Compartmented Information (SCI) eligibility. All 0689s assigned to Marine Force Cyber Command are required to maintain Top Secret (TS) with the additional adjudication of Sensitive Compartmented Information (SCI) eligibility. Duties: For a complete listing of duties and tasks, refer to NAVMC Directive 3500.106, Communications Training and Readiness Manual. (1) Computer Security Coordinator 033.162-01C. (2) Computer Security Specialist 033.362-010. Information Security Technician, MOS 0681. The jobs that feed into this MOS include Aviation Logistics Information Management Systems Specialist (MOS 6694), Cyber Network Operator (MOS 0651), Cyber Network Systems Chief (MOS 0659), and Intelligence System Administrator/Communicator (MOS 2651), Tactical Switching Operator (MOS 0612), Telecom Systems Chief (MOS 0619), Field Radio Operator (MOS 0621), Satellite Communications Operator (MOS 0627), Radio Chief (MOS 0629),Technical Controller (MOS 2821), Technical Control Chief (MOS 2823), Ground Electronics Telecommunications and Information Technology Systems (MOS 2847), Aviation Communication Systems Technician (MOS 5939), Air Traffic Control Communications Technicians (MOS 5954), Tactical Data Systems Administrators (MOS 5974).